To pay by credit or debit card please phone us on 01684 574865 or 07946169123 and we will confirm the product availability and process your card payment over the phone. 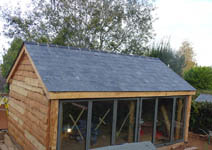 Our beautiful and unique Garden rooms and offices use timber selected and felled by us in local woodlands that we manage. We then process the timber into boards and shingles. We have chosen timber species that are renowned for their strength and durability. 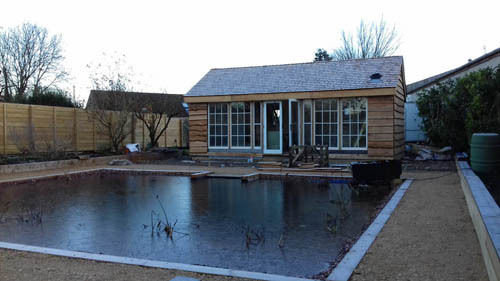 Our Garden rooms and offices are totally bespoke. 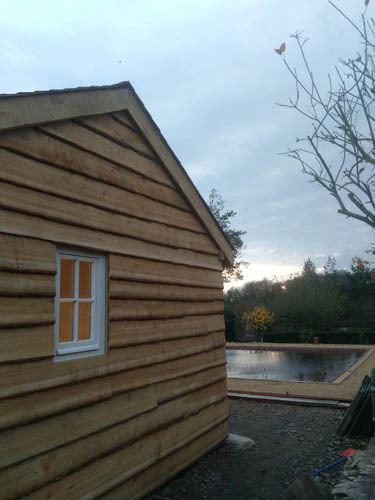 They feature wide timber floor boards from Larch or Douglas Fir, Cedar roof shingles made from our own timber, wall cladding in Larch and Cedar either horizontal or vertical. They are double skinned and fully insulated. You can choose various shapes sizes and styles with a variety of window and door options. Local delivery and construction are both included in our prices. • Fully insulated walls, floor and roof. • All timber used in the construction of these gazebos is sourced from local woodlands we manage with the exception of the Pressure treated timber which originates from sustainable forests in northern Europe. 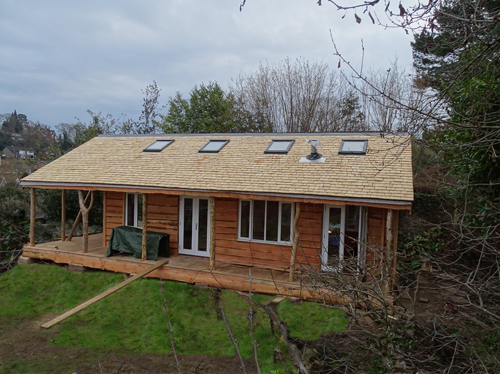 • Roof design utilising 125MM thick rafters, breathable membrane under Western Red Cedar shingles. • Flooring options are either wide Larch floor boards or vinyl cushion flooring over structural graded plywood. The garden room featured below has triple glazed roof lights , all windows and doors are double glazed, insulated thoughout, intenally clad with Cedar boards. Western Red Cedar roof shingles. To place an order, obtain a quote for a bespoke glamping lodge, summer house or other rustic structure or to discuss a project in more detail please Contact us. All structures pictured have been designed and built by us.